Owain Doull celebrated his first professional victory as he led a Welsh one-two at the Herald Sun Tour in Australia. 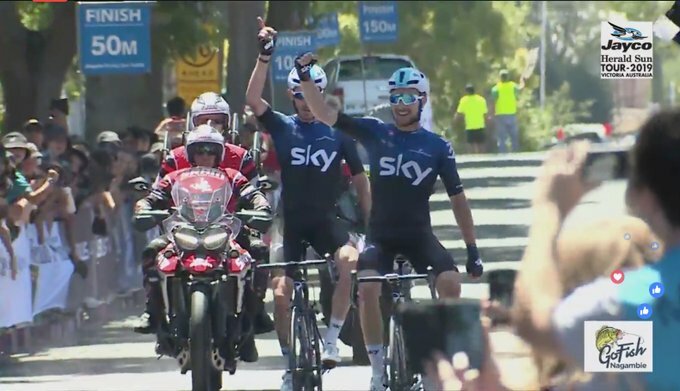 The Cardiff-born rider crossed the lead with Team Sky team-mate Luke Rowe after the duo attacked from a breakaway with 5km left on stage three. Rowe graciously told Doull he could take the honours at the end of the 161.3km stage to give the 2016 Olympic track champ his first win in the pro ranks. “We’d earmarked today’s stage as a potential day for the break to go, with how the race was unfolding, and we were both pretty keen,” said 25-year-old Doull at the finish. “Luke and I made sure that we lost time yesterday so that the break could get a bit of rope out on the road, and it came around perfectly for us with the two of us being away with 5km to go. The Sky duo were part of a nine-man break that led the bunch for much of the stage from before they attacked in the closing stages. And they crossed the line 25 secs ahead of the rest of the field celebrating together having bagged the team’s first win of the year. “Luke and I said we’d get everyone going through, and with 5km to go we just started ‘one-two-ing’,” added Doull. “Luke went first, and didn’t quite get the gap, and then I went over the top, and got a gap, and then Luke managed to jump across, and after that we just TTed [time-trialled] it to the finish. “It sounds simple, but it took a lot more than that. “At once stage Ithought it was going to come back together when Mitchelton-Scott getting involved, but the whole group worked really well today and we held off. “There was the big crash and I think everyone sat up and waited, I think [race leader] Michael Woods was involved so we all sat up and waited for him.